Over the next few days we’ll be publishing a four part series about the history of squatting in Brighton, which has been put together by the crew at Squatters’ Network Of Brighton (And Hove Actually). We’d love to publish more stuff about the stories and histories of squatting and land struggle around the UK and indeed the world: get in touch if you’ve got a tale to tell! The first version of this history is available as a beautiful free zine to download here. Squatting in Brighton has a long and illustrious history, some of which is captured here. If you want to add or correct something, please email. The contemporary squatting situation is quite good, there is a small but vibrant scene. Back in the day, presumably quite a bit of land was acquired by squatting it. In Hastings, a community of squatters laid claim to land created after a storm in 1287, at one point claiming to be the 24th state of the United States before being evicted. The land was called the America Ground. My family owned and ran Hodshrove Farm, which was then sold to the council and became known as “The Bates Estate”, which is now Moulsecoomb. My family moved down here in the early to mid 1800′s from Derbyshire. It is thought that the head of the family, Joseph Bates, moved down here to take on an estate management job for a wealthy Brighton resident up by Preston Park. It is thought that maybe the circumstances changed and they pitched up on the land, where Moulsecoomb is today, and ringed a fence around it. Effectively squatting. However, the law at the time stated that however much land you can fence in one night was legally deemed as your own. Thus the birth of Hodshrove Farm and nurseries. 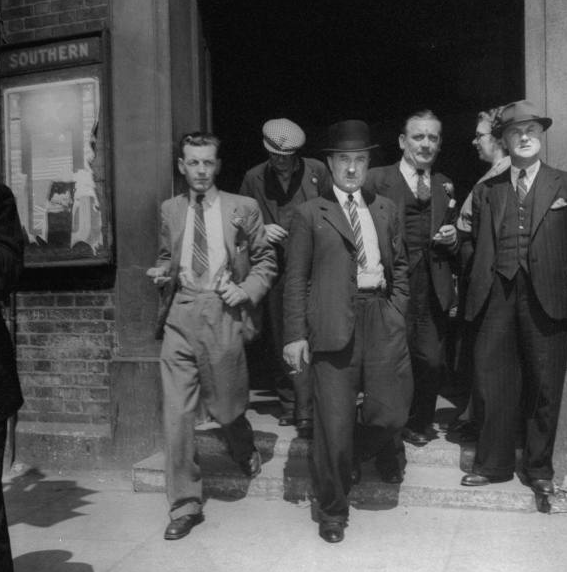 Harry Cowley and the Vigilantes took action to house ex-servicemen and their families. In recent times, squatting became an issue in the late 1940s, following Word War II. Servicemen returned to the UK with nothing and with nowhere to live, since their houses had been destroyed. Let down by the Government’s empty promises amidst the chaos of postwar reconstruction, they took direct action and occupied various unused army bases and empty buildings. The Mass Observation Archive at the University of Sussex has some fascinating first hand reports. Down in Brighton, that colourful character Harry Cowley and his Vigilantes were again squatting empties for families.